Remember! Partial regulations coming at you, or full regulations coming at you--which is it? CalBIT.com is not the CHP. This website is only a website. It does not constitute legal advice. It is in part an advertisement for BIT program products and services. 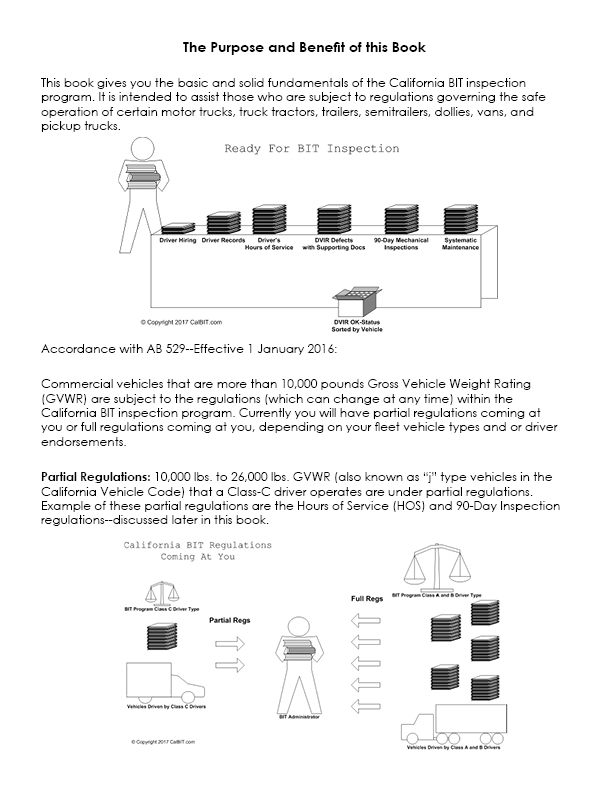 This website explains the California BIT inspection program in eight steps. These eight steps are taught in my free step-by-step video series on this website. In my e-book and paperback book you can also find these lessons along with the forms you will need to help administer your BIT program. 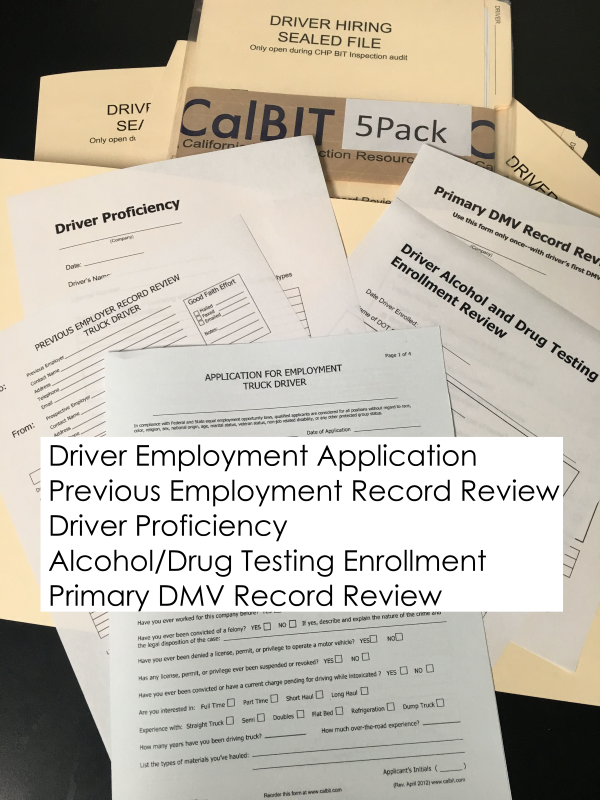 The fundamentals in these steps will provide you with a foundation to administer your BIT program, as well as, to present your program to the California Highway Patrol every 6 years, or sooner depending on the severity of your violations within the FMCSA national performance based priority system. I am a diesel truck, trailer, and transport refrigeration mechanic based out of Southern California. I have over 25 years of experience in the transportation industry. I have held service management positions at major truck dealerships, and truck rental and leasing operations in the southwest. 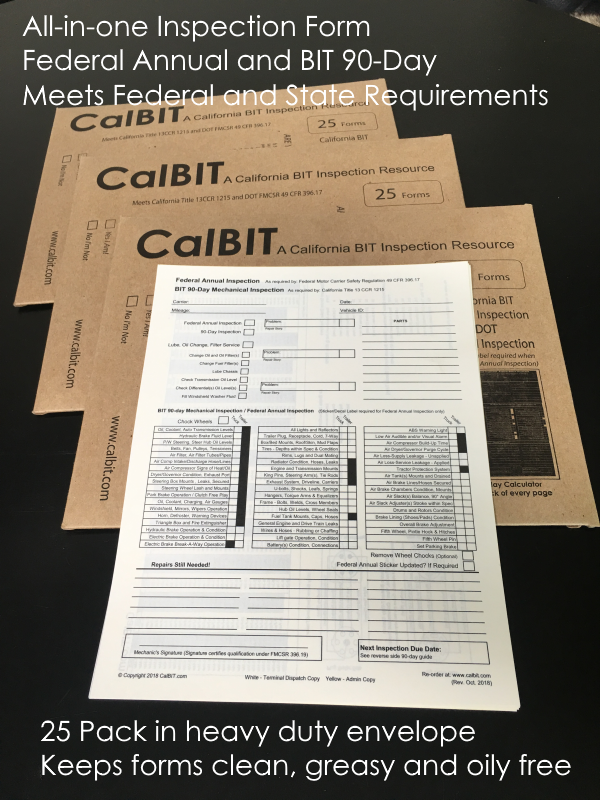 My years of experience has given me the day-to-day knowledge of the California BIT Inspection management process. I hope you don't let our Federal and State government's rules and regulations get you down. Keep it simple and don't over complicate it! 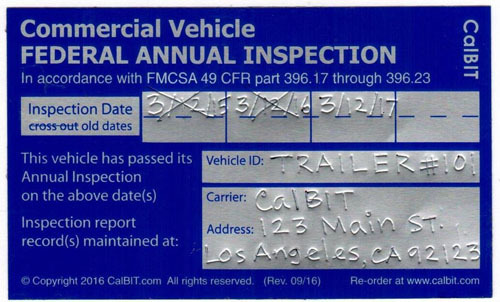 Federal Annual Inspection Sticker "Best Sticker"
Helpful 90-day calculator, air brake testing tips and trailer wiring recomendations on back of every form. Got a question or interested in consulting services, call (714) 476-6537 or message Rudy on facebook. 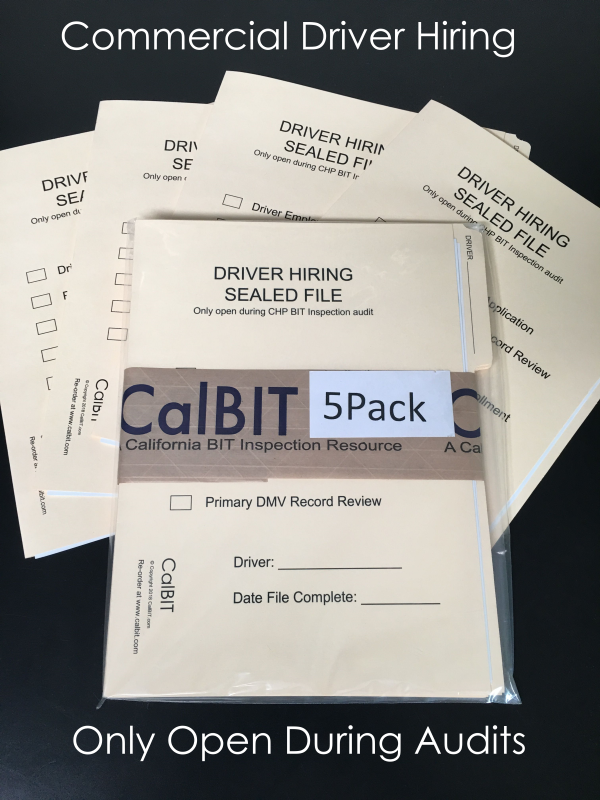 These files come with 5 forms inside each file folder. Checklist on cover of each file. Only open during DOT or CHP inspections. 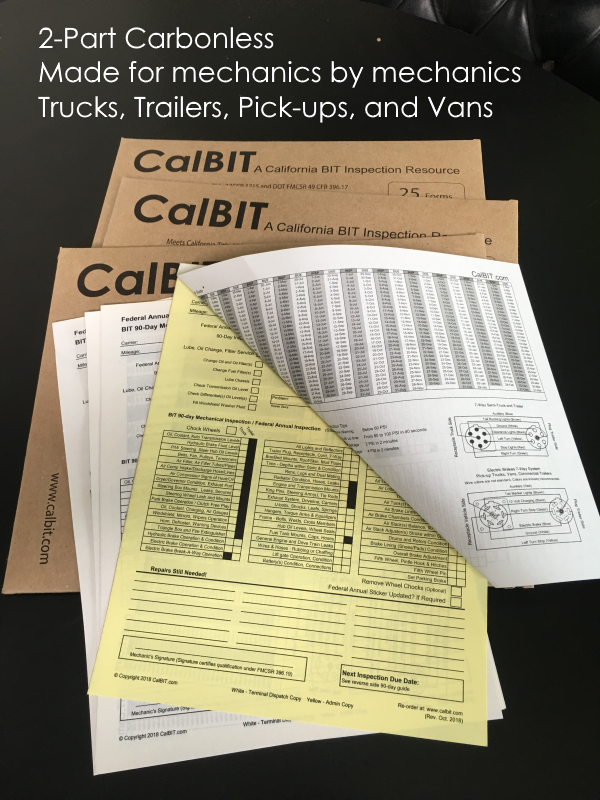 BIT Inspection Program eBook with all the forms you need to run your BIT program. Print forms as you need them. 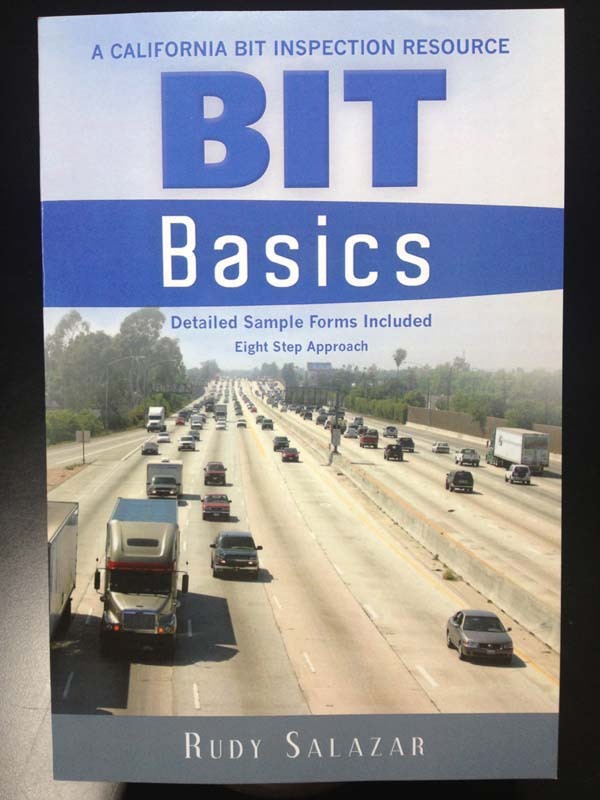 BIT Inspection Basics is a paperback book with sample forms. Great reference book to have around the office. "worth the price of admission"
Partial regulations coming at you means: 90-day mechanciacl inspections and Hours of Serive (HOS) only. Full regulations coming at you means relax and don't over complicate it.